Logan • Yes, it’s absolutely still party time in Logan. And yes, this magical season motored right along, beyond hapless San Jose State, as anticipated. These were answers to questions that no honest Utah State fan ever feared. That’s the kind of year it’s been up north. 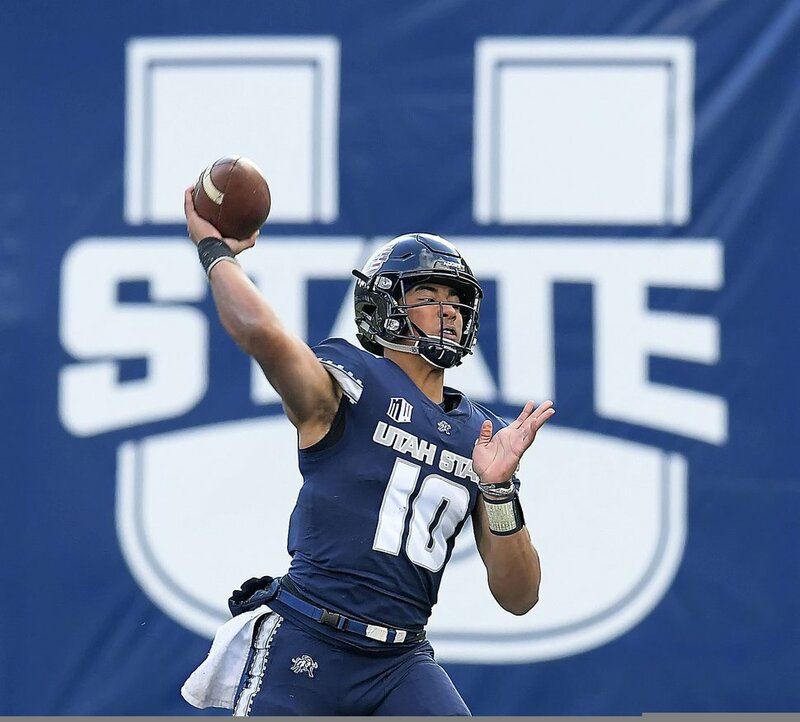 The 2018 theme continued Saturday afternoon inside Maverik Stadium, where the Utah State Aggies buried another opponent in what has become an all-too-familiar avalanche of points. These Aggies rolled on once more, just as they have since Week 2. The No. 14-ranked team in college football said goodbye to its home stadium this year — for now, perhaps — in runaway fashion by thumping the visiting Spartans 62-24. USU is 9-1 and soaking in one of its best seasons in program history; not that much changed beyond the win column. Utah State remains in control of, well, everything. “Our guys kinda keep drinking the Kool-Aid a little bit,” Utah State coach Matt Wells said. If these Aggies want a shot at a December home game, they’ll get it, if they finish off their still-unblemished conference record. Two more wins is an eternity away, though, even for a team as confident, as high-octane as this group. But the folks in Logan can taste it. That’s why even on a chilly, partly cloudy fall day, USU’s student section, The Hurd, was filled to the brim, and Maverik Stadium was again treated to another onslaught of offensive production. USU set a school record for total yards in a game with 804 yards. By the time the second half started, the stands were thinned as sun dipped and the temperatures dropped. The scoreboard did not. Quarterback Jordan Love’s stellar year continued, throwing for a career-high 491 yards on 32 of 42 passing attempts and five touchdowns. Running back Darwin Thompson finished with 255 total yards and three touchdowns. And Love, as diplomatic as a quarterback can be, hooked up with 10 different receivers. “We just kind of did the same thing we always do,” Love said. In the rout, USU broke a school record for most touchdowns in a season. The previous record was 60. These Aggies bested that mark with at least three games to spare, if you count USU’s eventual bowl game. 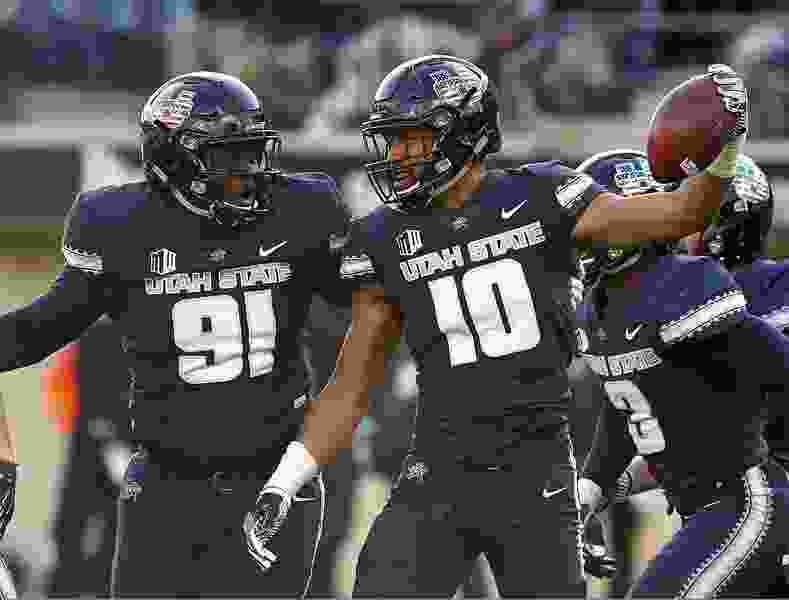 Maybe four if USU tops Colorado State next weekend, and on the road at Boise State on Nov. 24 in the regular-season finale, to host a would-be Mountain West Conference title game. Regardless, that’s the new normal. When you average over 50 points per week, nobody is unhappy. “Watching them in action, I’m like, ‘What is going on?’” senior safety Jontrell Rocquemore said. USU’s challenge now is the same as any program enjoying a season that could have historic ramifications. The good kind, of course. But the more wins rack up, the closer you get to the end of the regular season, that’s where the truest of tests are faced. And the Aggies, so often hunting MWC top dog Boise State (8-2), are now the hunted — at least in the Mountain Division. “We want to be on a collision course for a Mountain West championship,” Wells said. Now it’s about reducing the noise, reducing the distractions, Wells said. That’s a message being preached consistently. Wells said he’ll continue to tell his staff to tell the players to ignore the media attention, Twitter, the polls. That game on the blue turf in two weeks has plenty riding on it. USU won’t allow itself to get that far. Fans, on the other hand, are already dreaming, their stomachs also tied in knots.